Unlike your typical landlocked ranch trail rides, experience unforgettable horseback rides along the breathtaking coast of Oahu’s North Shore with our expert guides! This amazing opportunity to ride the finest polo ponies offers an experience not found anywhere else in Hawaii! Whether you want to enjoy the scenery or want to learn the art of Polo, we have a package that’s perfect for you. 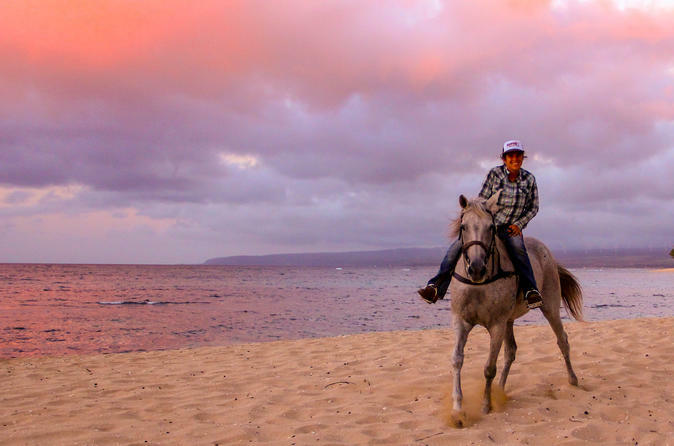 Join us and enjoy the scenic beauty of oceanfront horseback rides along Oahu’s famous North Shore! Give the gift of oahu's best equestrian experience! Highest RatedPrivate RideWant to have some alone time with your significant other, your kids, or both? Make any trail ride time slot your own! Private rides are available on any of our 3 ride times. Expect spectacular lighting on this tour during the 'golden hours' before sundown! Enjoy our beautiful oceanfront trail on the famous North Shore! Perfect for both experienced riders or for guests who have never ridden a horse before, our rides offer a fun and unique experience. Learn to play the 'sport of kings' on the famous North Shore! No previous riding experience necesary!